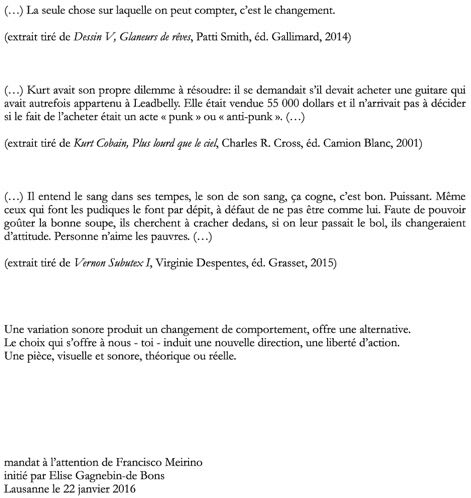 March 2016 at standard/deluxe, Lausanne, Switzerland. 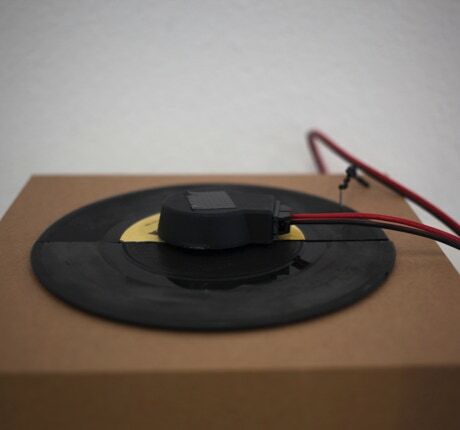 Vinyl records, cardboard, nails, electric wires, transducers, electronics, audio loop. polished with a an electric sander to change their sound, I’ve cut them in half and presented them as a new record, played by a rudimentary turntable made of cardboard, a nail and electrical wire. For this exhibition, founders and members of standard/deluxe have written or drawn instructions and individually handed them down to another member. The instructions are of various types. They are minimal, composite, enigmatic or rigorous. It is to each artist to carry out a work related to the appropriation of the mandate, its interpretation and sometimes also its diversion. Each of the protagonists of standard/deluxe presents a singular work that proceeds from this invitation to the realization. The result of this experiment, visible in space, leads to the reflection on the detachment that one can have in front of the initial rule and the distance that one chooses to put with the subject. The distraction takes its place and disturbs the first sense that the viewer can perceive.